Stain glass painting opens up an exciting number of options for you. Once you get the hang of it you’ll be able to add detail, texture and colour to your stained glasswork. Starting with line work is best, especially for beginners, as it can be fired first to give you a permanent reference point for the matting (or shading) that you do later. Palette, Palette knife, Water, Paint, Gum Arabic, Pipette, Painting brushes – the thin brushes are known as ‘tracing brushes’ – size 3&5 are good for beginners, A light box, Bridge or armrest. Glass paint will gather in blobs if the glass is dirty or greasy. You can clean it with rubbing alcohol – isopropyl is the best cleaning agent. Almost as good is a smear of your mixed paint on a tissue and rubbed over your glass. – Add some water to the edge of your mixed paint until it’s the consistency of thick evaporated milk. – It’s crucial to get this right – my students often try to start glass painting with paint that’s too dry and find that they run out of paint or their lines are uneven. – Too thick an application will result in blobby paint that blisters in the firing. Too thin and it fires off. Traditionally people did their tracing (line work) by following a what was called a ‘cartoon’ under their glass, but this may not suit you if you work in a more spontaneous manner. – Charge the brush by twirling it around in the paint. – Hold the brush in a perpendicular position gently between forefinger and thumb and rest your palm on the bridge. – Off you go! Don’t expect to get it right first time, it takes time to get used to stain glass painting. – Try pressing lightly and using just the tip of the brush. – Then try moving the brush quickly and slowly, to get an idea of the different marks you can make. 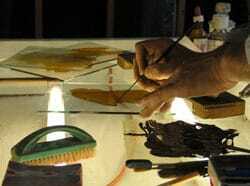 This photo shows artist Mark Angus using the whole length of the brush to make a stroke. – Have a go at that too. See how far you can go without running out of paint. – As water dries quickly, you’ll have to learn to keep going until you’ve finished – once the paint has dried it’s difficult to seamlessly add to it with wet stain glass paint. – You can easily tidy up lines with a needle pressed into a brush handle. 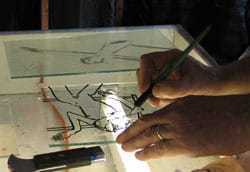 – You can work into your lines with a needle to enhance your stain glass painting. – You can really have fun with this – scratch patterns in or add detail – for example making hair ‘hairier’. Greasy fingerprints will fire in permanently, so you need to make sure your glass is free of them and any unwanted smears of paint. You’re now ready to do your initial firing. Segment 1. 570F/300C per hour to 1220F/660C (matt finish) – 1250F/675C (shiny finish). Soak 5 mins. Segment 2. Full to 1040F/560C. Soak 5 mins. Segment 3. 50F/10C per hour to 986F/530C. No soak. Off. This is a really good 5 minute video that takes you through the whole process of stain glass painting a face. It might be a bit off-putting as it’s quite a difficult subject, but you could try using the techniques on an easier drawing first. Once you’re happy with your line (or tracing) work, and have fired them permanently, you can move on to Blending Paint. Share the stained glass love! I am very much a beginner in stained glass but am willing to try anything new. I love it! I use the foil method.I want to make a monarch butterfly as part of an 18 inch round panel.My concern is how to make the white dots on the black parts of the bug. Should I paint them or use frit and attempt to fire them in? White paint is probably your best best at this stage unless you have a kiln and know about fusing glass and compatibility issues? You can get semi-permanent paint which fires in a domestic oven. I love your ‘go for it’ approach Terry! I fired some Heusche RE1333 red for flesh on flesh colored stain glass at 570 degrees F / hour up to 1250F, held for 5 minutes then lowered down to 1040F, held for 5 minutes, lowered to 986F, no hold, and then cooled as fast as possible. The paint is severely faded. I painted one piece over again and fired again at 1200F. Same problem. I am using a large Paragon pottery kiln with a Sentry 2.0 controller. Any ideas why my paint is fading? I think 1250F is too hot as a top temperature Joseph. But then I see you’ve tested at my recommended temperature – 1202F (650C) – and are still having the same problem. Fading normally does relate to the kiln being too hot, so you could do some test pieces reducing the heat until you find the correct top temperature for the combination of your kiln, the glass and pigment. You might also try going up to 932F / 500C slowly and then As Fast As Possible to the top temperature. The slower your ramp is to top temperature, the more exposure to heat the stained glass paint receives on the way up. You can also try without a soak at top temperature to reduce the amount of heat – lots of options and variations! There’s always a degree of testing to be done to find the optimum individual firing schedule I find. Good luck.